April 8, 2015 – Osborne, Kansas – Osborne Industries, Inc., a leading manufacturer and distributor of pig production equipment, has been awarded international electrical safety certifications on the Stanfield® Heat Pad, the company’s electric heating pad for baby pigs. In the CB Report, CA/16933/CSA, issued November 11, 2014, Osborne Stanfield Pig Heating Pads were shown to be tested and compliant with IEC Standards 60335-2-71 and 60335-1. The declaration was made by the CSA Group for Certification and Testing, Toronto, Ontario, Canada. Additionally, Osborne has received PSE Certification for conformity of its piglet heat mats in Japan and CE Certification for conformity in Europe. The company has maintained CSA Certification on the heating pads since 1983. This year marks 42 years since Osborne introduced its signature Stanfield Heat Pad. 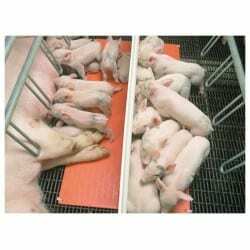 At the time, it was the first product of its kind: an electric heating pad to help newly born piglets grow in a warm, safe, and healthy environment. Since then, Osborne has manufactured and distributed hundreds of thousands of heat pads worldwide and continues to deliver safe, reliable, and economical heat for baby pigs, due to the company’s strong emphasis on quality. Osborne maintains an ISO 9001 certified quality management system. For more information on Osborne Industries, Inc., or the Stanfield Heat Pad, please call 1-800-255-0316 (1-785-346-2192) or visit osbornelivestockequipment.com.